This weekend, we remember the triumphal entrance of our Lord Jesus into the holy city Jerusalem. What immediately followed was his worldly humiliation, torture and execution. We remember that nonviolent responses to injustice and violence are mocked by most people in every generation. They are neither popular nor successful in the ways the world keeps score. This weekend, students from across our country and the world will enter cities of power, rallying for their right to learn in relative safety. They recognize that gun violence is a scourge upon our nation, our neighborhoods and our schools. They know that their lives and the lives of their classmates hang in the balance. They know that they must respond nonviolently as the prophets who have gone before them have done. The prophet Isaiah called our ancestors to "beat their swords into plowshares and their spears into pruning hooks.” (Isaiah 2:4) Student prophets today are standing against over-accessibility to instruments of mass violence in our time. Their concerns about guns used to kill students is a contemporary voicing of Isaiah&apos;s concern about swords used to slaughter innocents and my elders concerns about atomic weapons with the power to destroy the earth. As a responsible gun owner myself, a sportsman, the brother of a New York City police officer and a priest in God&apos;s one, holy, catholic and apostolic church - I support our students in body, mind and spirit. Indeed, they inspire me. I hope that their generation will be remembered for leading a revolution of peace beyond my understanding. Their passion and leadership is what we need right now. This is their moment, not ours, and God willing they will have many more. Youth movements are nearly always at the forefront of faithful change for the better in society. Today, I am honored to be on their bus. 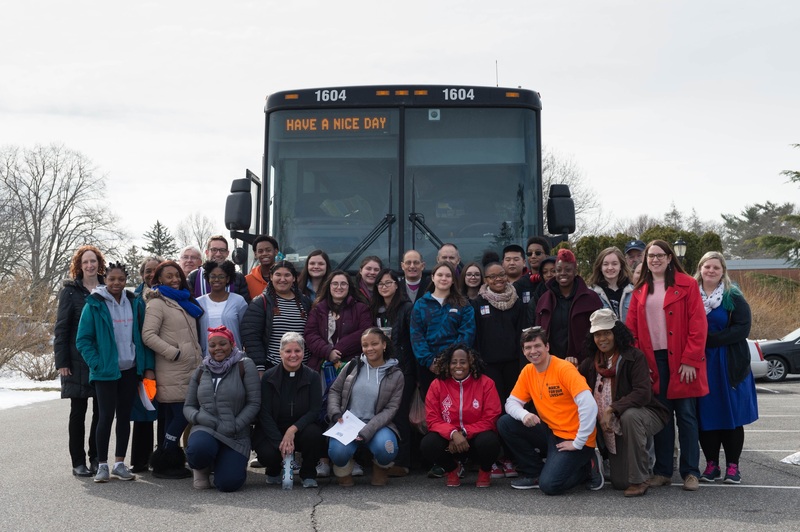 I am humbled to accompany young leaders from the Cathedral of the Incarnation and across Long Island as we join students from Parkland, Florida and other communities marred by violence at the hands of human beings with weapons designed to shoot lots of bullets at high speed as quickly as possible. Tonight we will share with our bishop in an interfaith vigil at our Washington National Cathedral in Washington, DC. Tomorrow, Canon Delaney will travel with over 100 students from Adelphi University to join us for the March for our Lives on the National Mall. This weekend of nationwide student action will not solve the problem of violence in our schools or our society. However, I hope that by God’s grace it will give encouragement to a new generation of leaders who are already building a future of increasing peace - A future of mutual security beyond what my generation of leaders or those preceding me in recent generations have provided for them. Standing and speaking out for safe schools and safe guns is not and should not be a divisive political issue. It is not a Second Amendment issue. That is a red herring and our young people see through it. What we face together is a multifaceted humanitarian crisis with many comorbidities. It is complicated, but it is also clear. Our response, rooted in the ministry of Jesus Christ, must be sustained, loving and nonviolent. It must honor God, the victims and potential victims above any ideology. In this Holy Week we commit ourselves again to Christ&apos;s path of peace, the way of the Cross. Join me in offering support and encouragement to the Cathedral&apos;s student leaders who have faith in a brighter tomorrow. They are not only the leaders of their generation - they will be, with God’s help, the leaders of ours. May their efforts in making the world a better place surpass ours in every way.